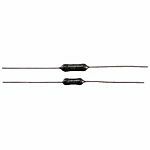 Through hole fixed resistors are used to reduce the flow of electrical current within a circuit. As fixed resistors, they have predetermined values (voltage range compatibilities), unlike variable resistorswhere the voltage range values can be adjusted. Through hole fixed resistors are constructed from metal film for general usage or carbon film for devices that require high tolerance. They have long, pliable leads that are inserted (either automatically or manually) into holes in printed circuit boards. What are through hole fixed resistors used for? Through hole fixed resistors are used in the automotive, telecommunication and medical equipment industries. They are most suitable for larger circuit boards and prototyping projects where no soldering is required. Axial packages have flat profiles and cylindrical or box-shaped formats with leads on both ends. They are used for short distance applications. Wire wound resistors have metal wires wrapped around cores made from ceramic, plastic or fibreglass, which give them higher power ratings.